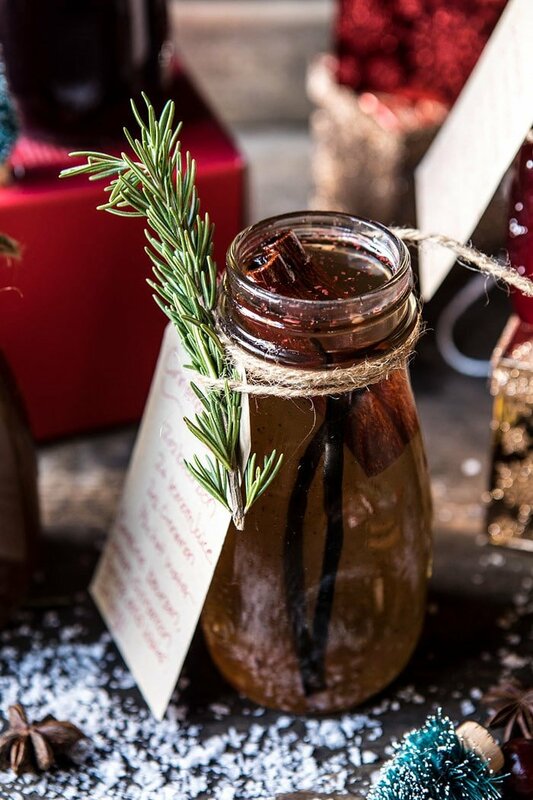 Holiday Gifting: Homemade Simple Syrups. 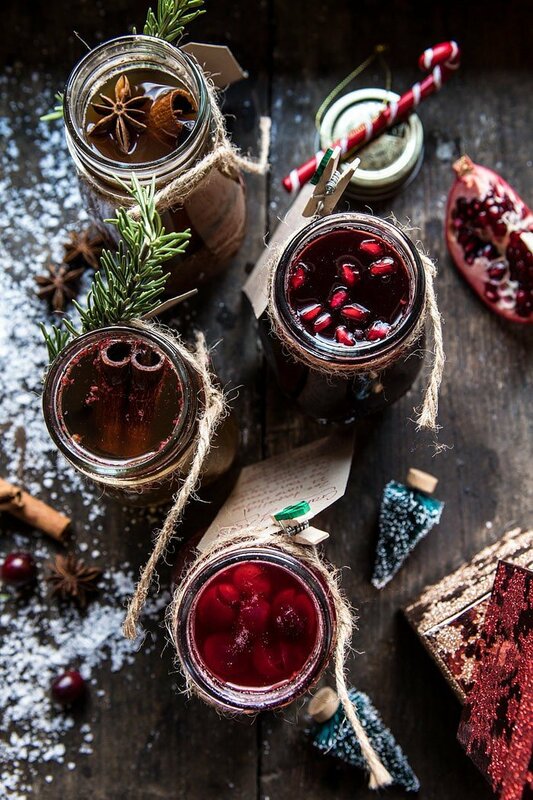 Next post in my holidays series…Holiday Gifting: Homemade Simple Syrups. Hey, hi! Happy Sunday everyone! 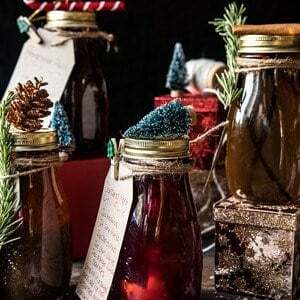 Today we’re talking homemade holiday gifts! And as usual these days, I am pretty excited about it. I truly get into the holiday season every single year. But this year feels like I’m embracing it even more than usual. I’m trying to find other ways to connect with the season, as we still have almost no snow here in Colorado. Normally by December we have a thick solid coat of snow on the ground. Everyone in our little mountain town is impatiently waiting for that first big snow fall. Well technically second. The snow from the storm on October 1-2 is long gone…hoping for snow on Monday! Anyway, back to gifting…in my opinion nothing beats something that you spent time putting together for someone. I mentioned this a bit last week, but I love holiday gifts that are thought out and take a little time to prepare. I think it shows when you put some effort into creating a gift you feel your recipient will love. Plus, I really just love any excuse to get a little crafty and make things look cute. Especially, cute and Christmassy. 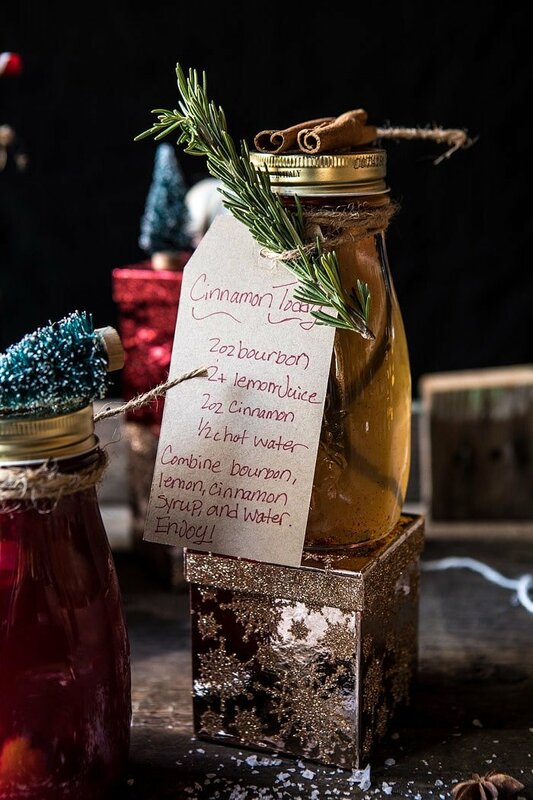 I saw this idea of gifting simple syrups in the December issue of Martha Stewart. 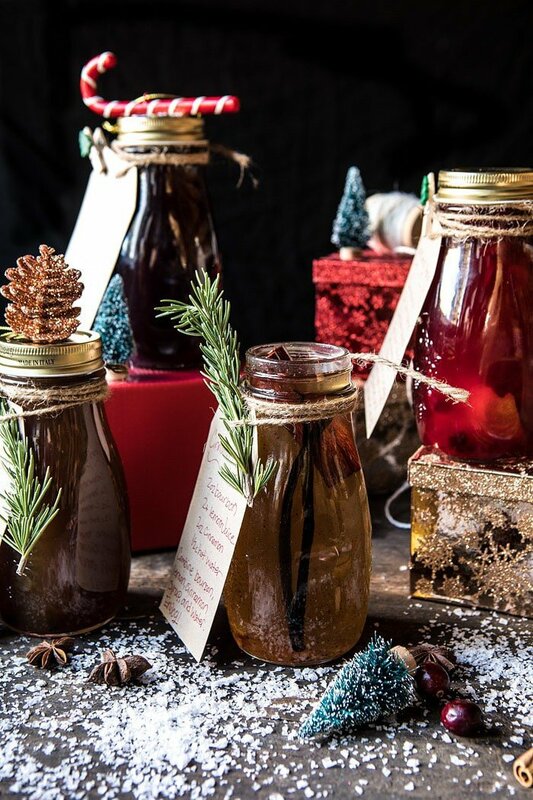 When I came across the idea I knew I wanted to create some of my own syrups to share with you. 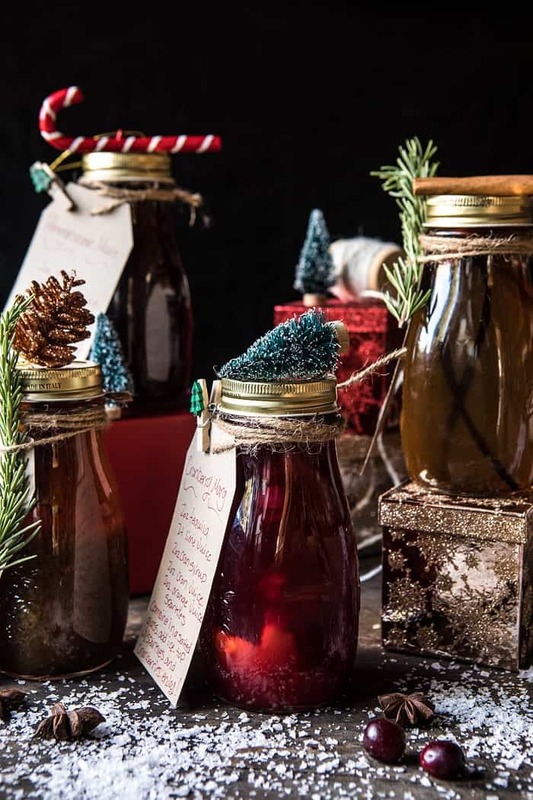 It’s such a fun gift idea, and I have so many syrup ideas in my head…choosing just four was really hard. If you’re new to simple syrups, making them at home is actually so easy to do. And the syrups I’m sharing with you can be mixed into so many different cocktails, the options are really endless. First, Pomegranate Ginger Syrup. You guys know I am head over heals obsessed with pomegranates. So I wanted to create a syrup that was pomegranate flavored. I love the combo of pomegranate and ginger, so naturally this one needed to come to be. I love using this syrup to make a pomegranate paloma (use as the syrup in the recipe). Second, Cinnamon Spice Syrup. This is sweet, cinnamony and touched with just a little spice. 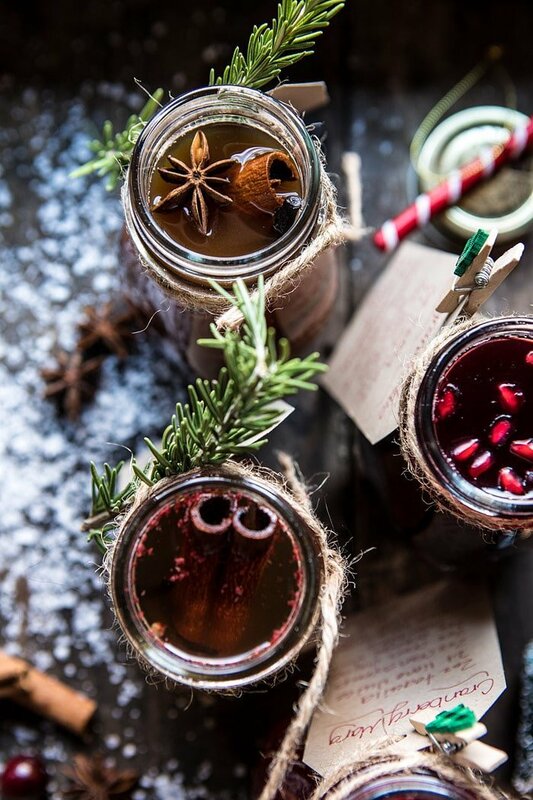 It’s perfect for a warm cocktail, like yesterday’s naughty and nice toddy (use in place of the honey) or a hot buttered rum. Third, Vanilla Chai Syrup. Could not be more in love with this. 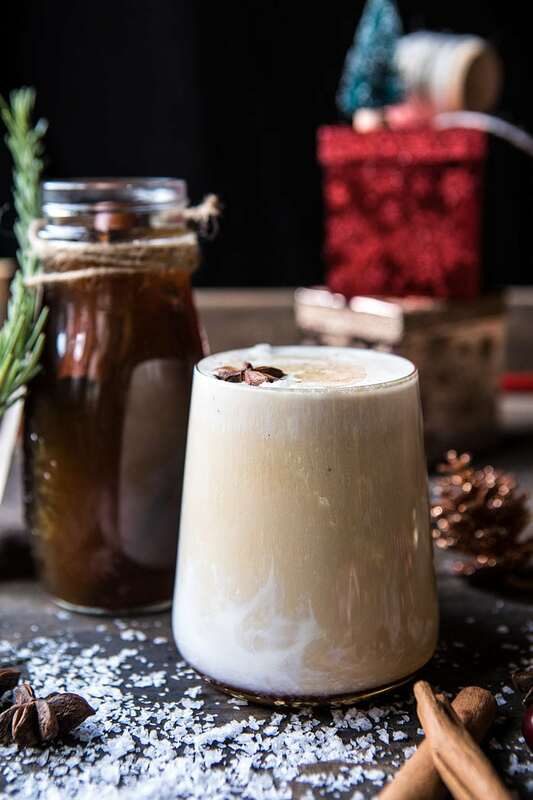 It’s chai tea in a sweet syrup form and it makes mixing up this chai white Russian an easy thing to do any night of the week. 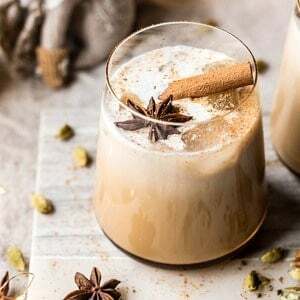 This would also be delicious in just about any bourbon based cocktail like this old fashioned or a warm chai bourbon tea. Forth, Cranberry Orange Syrup. This is December in syrup form. It’s sweet, spiced with winter citrus, and hinted with just a little bit of thyme. 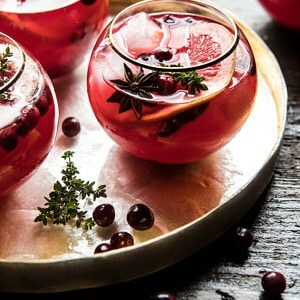 I LOVE using it in this cranberry orange margarita (use in place of the sugar) or this cranberry thyme spritz (use as the syrup for the recipe). A few notes, I prefer to use honey to sweeten my syrups, but I also gave you the option to use sugar. Honey does add a little flavor, but sugar will sweeten the syrups without adding any flavor. Both work equally well. I used glass jars that I found at Target, but any jar with a lid will do. I also finished each jar off with a gift tag to label the syrups and then decorated them festively. Making simple syrups at home is actually so easy to do. And the syrups I'm sharing with you can be mixed into so many different cocktails, the options are really endless. 1. In a medium pot, bring the pomegranate juice, honey (or sugar), and ginger to a boil over high heat. Once boiling simmer 1-2 minutes and then remove from the heat. Let cool completely. Strain out the ginger. Transfer to glass jar. Store in the fridge for up to 1 month. 1. In a medium pot, bring the water, honey (or sugar), cinnamon, cardamom, and vanilla bean to a boil over high heat. Once boiling simmer 3-5 minutes and then remove from the heat. Add the peppercorns. Let cool completely and then strain into jars. I like to add the cinnamon sticks and vanilla bean to the jars as well. Store in the fridge for up to 1 month. 1. In a medium pot, bring the water to a boil. Remove from the heat, add the chai tea bags, cover and steep 10-15 minutes. Remove the tea bags and add the honey. Bring to a boil over high heat. Boil 3-5 minutes, then remove from the heat. Stir in the vanilla. Let cool and then pour into jars. Keep in the fridge for up to 1 month. 1. In a medium pot, bring the water, the honey, cranberries, thyme, and orange slices to a boil over high heat. Boil 5 minutes or until the cranberries begin to burst, then remove from the heat. Let cool. Remove the thyme and orange. If desired, strain out the cranberries. Pour into jars. Keep stored in the fridge for up two weeks (even with the cranberries) or up to 1 month (without cranberries). Pineapple Glazed Pork Roast with Bacon Wild Rice Stuffing. 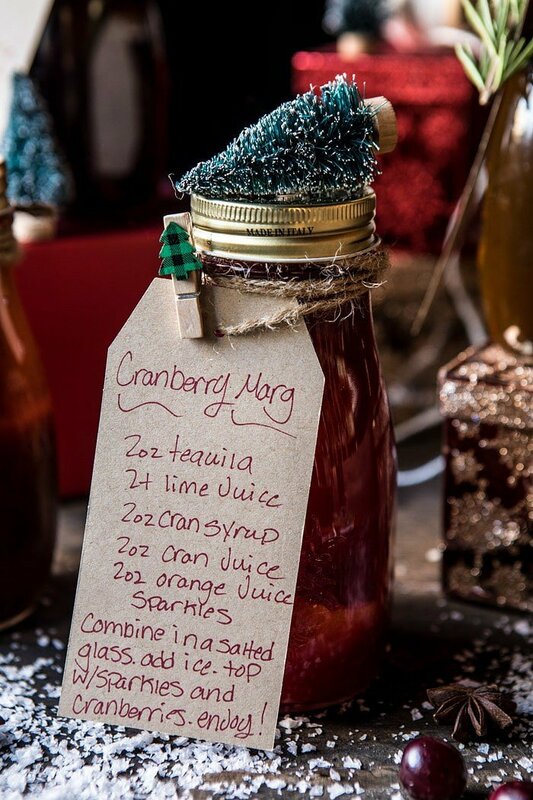 Hmm i just got a few ideas for syrups so I’m embarking on these this year!!! Perfect! I hope you love these Ruth! Thank you! What a lovely idea! I’ve never made anything like this before, but can tell it would be such a cool and unique gift to give someone, or add into a hamper present for them! Yes! So glad you like this! Thank you Rebecca! I would like the same information. I was thinking it could also be used to sweeten herbal teas. Woke up this morning to Tieghan in my inbox with your usual awesomeness, but then -surprise…! Who is on the cover of my Sunday Denver Post? Red Gerard, your snowboarding rockstar little brother. Who totally gives props to you in the article too! Haha. Great article and YEA for the Gerard Family for all of your hard work and successes. Will be following Red for sure as he heads into competition leading up to Olympics! Ah that is amazing! Thank you so much Crystal, I am really proud of him and what he is doing! What a great idea for holiday gifting Tieghan! I LOVE the flavors, especially the Vanilla Chai!! These are so beautiful. Thank you for the great gift idea!!! I am so happy you like these Chantee! Thank you! Hi! Gingerbread houses is such a great idea, I love making those with Asher! Thank you Kristin! This holiday gift is very nice. I bought a gift for my friends. Could you use dried cardamom? These are stunning. I really love the shape of the jars. Where did you find them? 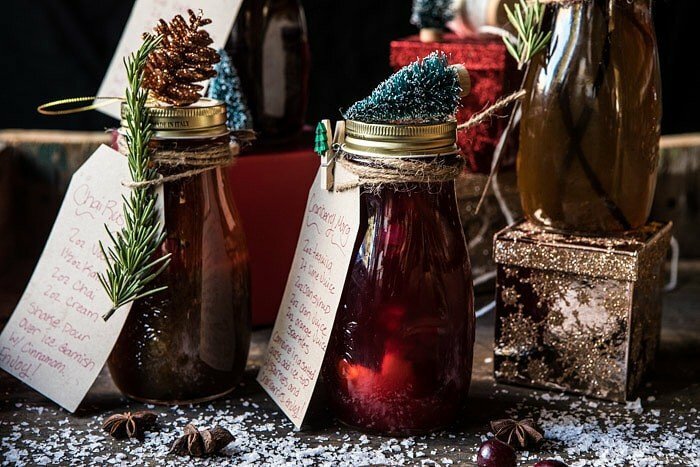 I love these syrups, such a gorgeous holiday gift idea! I am SO EXCITED to make these as gifts this year! 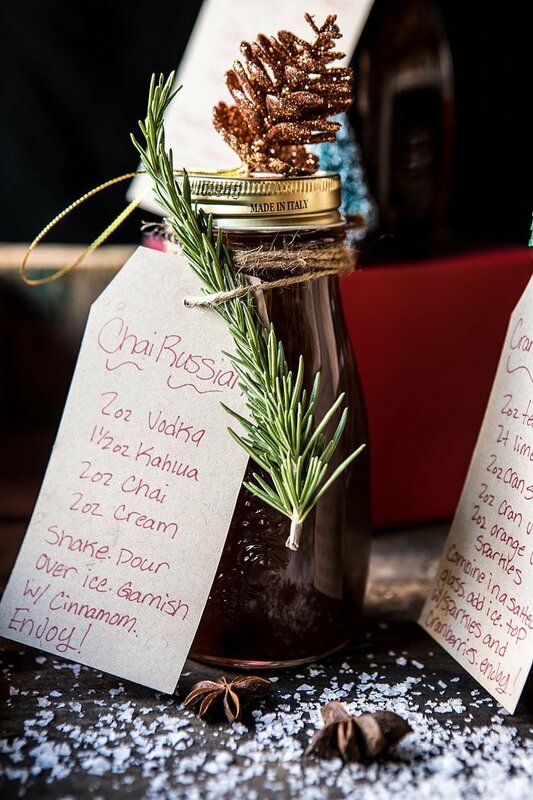 I want to include a basic old fashioned recipe to use the vanilla chai syrup in. Besides bourbon and syrup, what else would you put in the drink? HI! I would add 1-2 dashes of orange bitters (or you favorite bitter), an orange slice and then top the drink off with sparkling water (if desired). Old fashioned are super simple! These are fabulous! I know you said they all have a month(ish) shelf life in the fridge, but can they be stored at room temperature at all? Trying to figure out the logistics of giving them as a gift or shipping them to friends in other states. What gorgeous gift ideas! I’ve already ordered those lovely jars from Target! 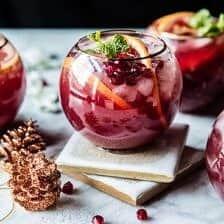 Just a few questions: did you use a whole orange in the cranberry syrup? I see the directions say “4 slices,” so I wasn’t sure if that means one whole orange cut up into quarters? And you don’t keep the orange slices in the jars, right? 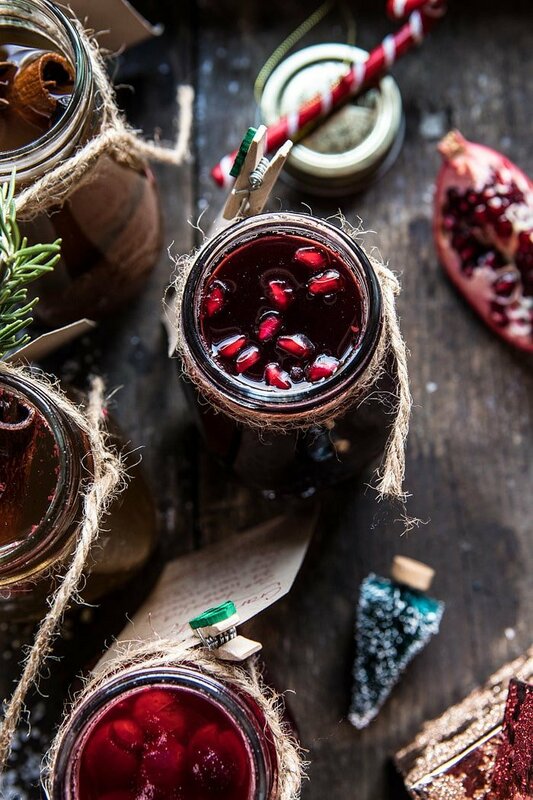 Can you add fresh pomegranate seeds to the jars or will they get mushy? Last one, sorry! What are those cute little star-shaped guys i see pictured?! Any feedback would be helpful and appreciated! 1.) I just used 4 slices of fresh orange from about halve a medium size orange. 2.) I don’t like to add fresh pomegranate arils to the syrups as they can get a little mushy over time. It’s best to just add the pomegranate arils to the drinks before serving. 3.) I believe the stars you are referring to are star anise, which is a spice! Merry Christmas!! About how many jars does each individual recipe fill/create? Thanks brightly & warmly, Tieghan! I just made the Cranberry simple syrup yesterday! So simple and pretty!!. I removed the cranberries since I wanted to give some as gifts. I could not bear the thought of throwing away those beautiful syrupy berries so I removed the orange peel and thyme and then made myself a breakfast parfait! Layer plain greek yogurt with sliced banana and some of the cranberries and topped it with granola! Best breakfast treat!! Can’t wait to make the cocktails tonight! I have 2 more bags of cranberries calling my name! Thank you for the great recipes! That sounds like such a good breakfast! I am so glad you like this recipe! Thanks! holiday is the best season my life. I receive this holiday Gift. It is very fan testy. I am glad you liked this! Thanks! this is very nice food. I eat this food. 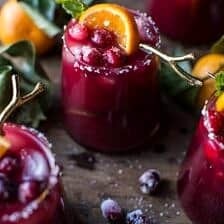 Amazing Recipe post!! Thanks for sharing with us. It is really beneficial to me …. keep it up.. Brilliant and fantastic Recipe. More, please… Your site always goes beyond unique Recipe list. Thanks for sharing this great holiday gifting us. Nice information about homemade syrup. Thank you for this great list with us. I just want to say thanks for your wonderful homemade recipe post, it images a lot of knowledge and information that I needed right now. Thank for sharing with us this great post.